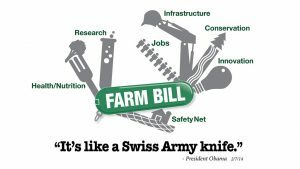 The Farm Bill (formally the Agricultural Adjustment Act) has a history of being hotly contended, and in the current climate of political polarization, that is truer than ever. The previous bill, passed in 2014, was two full years late. It also contained nearly a trillion dollars in spending, 80% of which was for SNAP (the Supplemental Nutrition Assistance Program, formerly known as food stamps). This year’s draft is likely to contain deep cuts and new work-eligibility requirements for SNAP, along with the much-discussed “Harvest Box” idea that would replace electronic cash benefits with a Blue-Apron-like delivery of non-perishable commodity surplus foods. Expect fierce resistance from anti-hunger activists and House Democrats as the bill moves into the debate phase. ← So much food at Tufts!